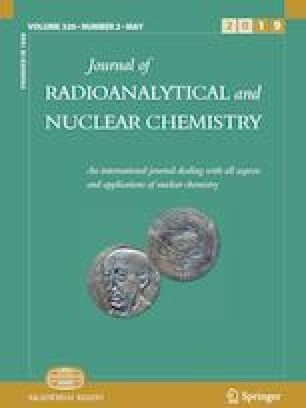 N,N-di-2-Ethylhexyl diglycolamic acid (HDEHDGA) in n-dodecane is being emerged as a promising solvent for the separations at the back-end of nuclear fuel cycle. Present paper deals with the evaluation of its density, viscosity and inter facial tension, and their dependency on absorbed dose, temperature and composition. The experimental data was used to calculate apparent molar volume, excess molar volume, viscosity deviation, activation energy for viscous flow, enthalpy and entropy changes of activation. Redlich–Kister type equation was solved for these properties, the coefficients of third degree polynomial that fitted with the experimental data, and their dependency on temperature and absorbed dose was studied. The online version of this article ( https://doi.org/10.1007/s10967-019-06499-5) contains supplementary material, which is available to authorized users. Authors would like to thank Dr. K. A. Venkatesan of Fuel Chemistry Division, IGCAR for allowing his lab facilities during the synthesis of HDEHDGA.